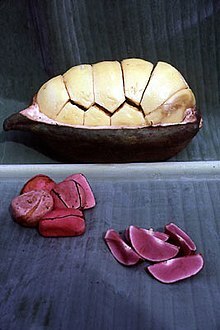 The kola nut is the fruit of the kola tree, a genus (Cola) of trees that are native to the tropical rainforests of Africa. The caffeine-containing fruit of the tree is a flavoring ingredient in drinks. Such beverages often use the word "cola". This page was last changed on 28 September 2018, at 07:23.